Immunogen: Synthetic peptide corresponding to the sequence near the N-terminus of rat GPR55. 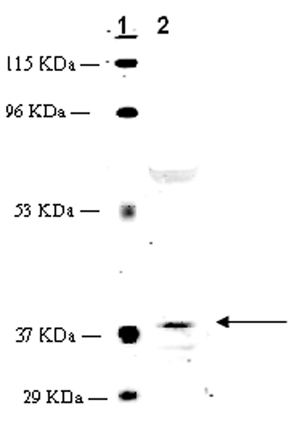 Application Notes: Predicted MW of ~34kDa, observed by Western blot ~37kDa. Higher MW species (~60kDa) and intermediates also observed by Western blot which reflect post-translational modification of the receptor. Scientific Background: The cannabinoid receptors CB1 (expressed primarily throughout the central nervous system) and CB2 (expressed in peripheral tissues) are members of the seven-transmembrane domain-containing family of G-protein coupled receptors (GPCRs), and are named for their signaling function in response to cannabinoid drugs such as delta-9-tetrahydrocannabinol (delta-9-THC). Significant evidence suggests that additional cannabinoid receptors may contribute to the many behavioral, vascular, and immunological effects of agonists such as THC and endogenous cannabinoids. Evidence suggests GPR55 may act as a cannabinoid receptor, although its definition as a bona fide "CB3" receptor remains controversial. GPR55 is highly expressed in large-diameter dorsal root ganglion (DRG) neurons, and its activation by cannabinoid compounds (THC, JWH015, and anandamide) has been shown to release calcium from IP3-sensitive ER stores. These findings are opposed by evidence that suggests GPR55 is an intrinsic receptor for lysophosphatidylinositol (LPI).